Tal Wilkenfeld’s 2007 debut album was titled Transformation, and although it was an instrumental record made with a handful of New York City’s top jazz musicians, the connotation seemed clear. 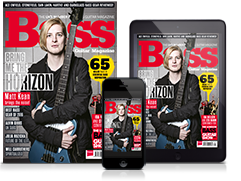 After all, here was a musician who moved from her native Bondi Beach, Australia to Los Angeles at 16 to pursue a career playing bass guitar, and within a handful of years she had become a YouTube-aided global sensation. The flashpoint? A viral clip of her expressive solo on Cause We’ve Ended As Lovers, as a member of Jeff Beck’s quartet at Eric Clapton’s Crossroad Festival in 2007. Fast-forward a dozen years, and the album title seems to have revealed its true meaning at last. For while Wilkenfeld has been nothing short of a marvel as a bassist for hire with everyone from Chick Corea, Herbie Hancock, Toto and Prince to Mick Jagger, Ringo Starr, Jackson Browne, Keith Urban and Ryan Adams, she has returned to her very first incarnation: singer-songwriter. Transformation indeed. Love Remains, Wilkenfeld’s sophomore solo effort, is a stirring collection of 10 songs drawn largely from life experiences garnered during her time providing low-end in the limelight. The framework is rock ’n’ roll, but this is no one-car garage creation. Along with guitarist Blake Mills, drummer Jeremy Stacey, keyboardists Benmont Tench and Zac Rae, and coproducer/ guitarist Paul Stacey, Wilkenfeld unveils a soundscape wide and warm. Interlocked electric, acoustic and bass guitars conjure ambiguous harmonies and nuanced support parts that help her deliver her introspective lyrics in a voice that is sometimes delicate, sometimes dirty, but always direct from the heart. With her new mission in place and her schedule cleared to be home in Los Angeles writing, Wilkenfeld found the perfect mentor in Jackson Browne. She recalls, “I met Jackson while performing with Jeff Beck at the Rock And Roll Hall Of Fame 25th Anniversary at Madison Square Garden. As I began recording my songs I would ask him for advice, and he was beyond helpful, taking the time to share his wisdom and knowledge. I feel very fortunate to have him as a friend.” As a result, Jackson is credited as Executive Producer on Love Remains, having overseen the record’s process. Wilkenfeld cites Browne as more than just a major songwriting influence. “A lot of the artists who inspired me were ones I was introduced to during the making of the album, and that was thanks to Jackson and Benmont, who I’d met through Jackson. She adds: “It was very helpful to have Paul Stacey working on this with me, because he’s musically diverse and I trust his taste and experience. He offered a lot of great ideas, and even when we disagreed about certain things, he took a stance when he believed it was right for the music. It was a culinary catalyst that brought the album’s ensemble together. She chuckles, “I’ve met so many key people in my life through my love of sushi! I made plans to have sushi with Benmont. He invited Jeremy, who I’d met briefly at Eric Clapton’s Crossroads festival, and halfway through the dinner, Paul showed up. Meanwhile, the transition to singer-songwriter had an effect on Wilkenfeld’s bass playing. “I’m a completely different bass player now than I was 10 years ago. When I was in Jeff Beck’s band, I hadn’t even been playing for four years!” she tells us. Tal’s bass on Love Remains pivots between dual roles. There’s the solid, song-minded support, as on the fiery Hard To Be Alone, the stadium rocker Killing Me and the forlorn ballad Pieces Of Me. The album’s crown jewel may well be Haunted Love, a bass and vocal ballad. Wilkenfeld took her Sadowsky NYC five-string, strung it E-A-D-G-C, added a capo at the third fret, and accompanied herself fingerstyle via chords and arpeggios comprising close voicings and open strings. Her fans got a preview of this unique approach when she performed Leonard Cohen’s Chelsea Hotel at Bass Player LIVE! 2013, where she was presented with BP’s Young Gun award. Elsewhere, Wilkenfeld played an early-60s Harmony H22 hollowbody bass on Under The Sun, which features her freely phrased bass melody at the start and end. For the bulk of the album, Wilkenfeld turned to a Fender Precision belonging to Browne. Bass notes come from diverse sources on the album. One Thing After Another uses a woodwind ensemble with bass clarinet on the bottom for a different colour. Corner Painter was recorded on a baritone acoustic guitar, coupled with Blake Mills’ tuned-down electric guitar. 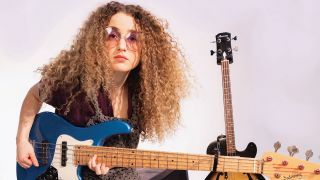 Looking back at Wilkenfeld’s career, bass has served as the through line. Although she arrived at the Los Angeles Music Academy to study guitar, she switched to bass in her second semester. Wilkenfeld credits Marcus Miller with being the first bassist to sit down with her and offer his guidance. Soon after, she was drawn to New York City by Wayne Krantz’s albums Long To Be Loose and 2 Drink Minimum (both from 1995), which featured the rhythm team of bassist Lincoln Goines and drummer Zach Danziger. Once there, her in-person tutelage continued via Anthony Jackson and Oteil Burbridge. Word of the ‘Wonder From Down Under’ soon spread, leading Wilkenfeld to play with Krantz, Hiram Bullock and Jeff ‘Tain’ Watts, and sit in with the Allman Brothers and Susan Tedeschi. Her aforementioned debut album, Transformation, resulted in tours with Chick Corea and, of course, her breakout role with Jeff Beck. Online and TV appearances with Beck led to touring and recording with Herbie Hancock and studio time with Prince. Reflecting on those post-album experiences, she relates: “They were all highly inspirational people to be around. Prince recorded to tape and worked very quickly, and he never wanted to punch in unless it was absolutely necessary. That taught me how to work fast and effectively, and commit to my decisions. While Wilkenfeld’s Beck association led to performances alongside such rock royalty as Mick Jagger, Jimmy Page, Ringo Starr, Buddy Guy, Joe Walsh, Steven Tyler, Sting and Billy Gibbons, it was a brief meeting with Pete Townshend in 2014 that resulted in her opening for The Who. As 2019 unfolds, Wilkenfeld will focus on Love Remains. Having performed well-received album launch shows in Los Angeles and New York, she will continue to tour in 2019. That duality also applies to Tal’s career, as she evolves from being known simply as a prodigious bassist to a singer-songwriter, composer and producer too. She has no plans to abandon her role as an in-demand session player, producer or side musician.